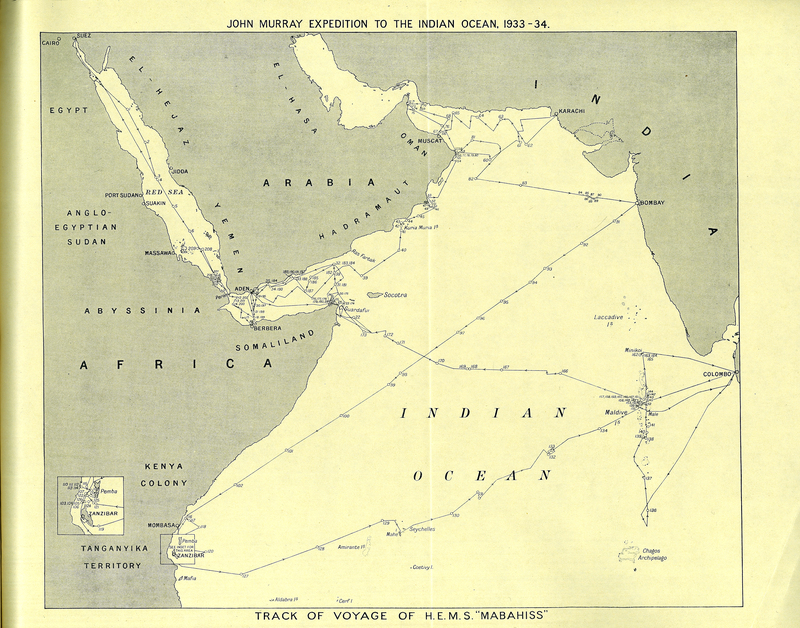 The John Murray Expedition of 1933-1934 ‘pioneered bilateral relations in the field of oceanography, at a time when the Law of the Sea was not even an embryonic concept’ (Aleem & Morcos, 1984). Funded by a £20,000 bequest from oceanographer, John Murray, this expedition was a collaboration between Britain and Egypt. Aboard HEMS Mabahiss, British zoologist Lt. Col. Dr R.B. Seymour Sewell led a team of scientists to research the oceanography, geology, and mineralogy of the Red Sea and the Indian and Arabian Oceans. The trip took nine months and eleven volumes of data collected were published from 1935 to 1970. ___, “The John Murray Expedition, 1933-34. Scientific Reports. Vol. I,” ourheritage.ac.nz | OUR Heritage, accessed April 22, 2019, http://otago.ourheritage.ac.nz/items/show/9643.